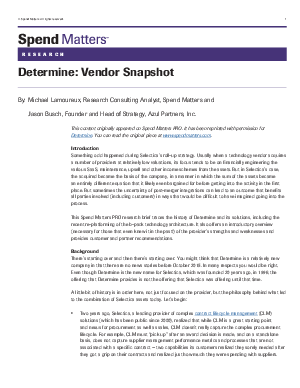 This Spend Matters PRO research brief traces the history of Determine and its solutions, including the recent re-platforming of the b-pack technology architecture. It also offers an introductory overview (necessary for those that even knew it in the past!) of the provider’s strengths and weaknesses and provides customer and partner recommendations.